BMW went back to “tested but halted technologies” drawer to recover water direct injection which is used for the first time ever on a series production car on this new GTS, a black M4 with a menacing Darth Vader look. Totally becoming as the alter ego M4 is capable to deliver out of this galaxy performances. 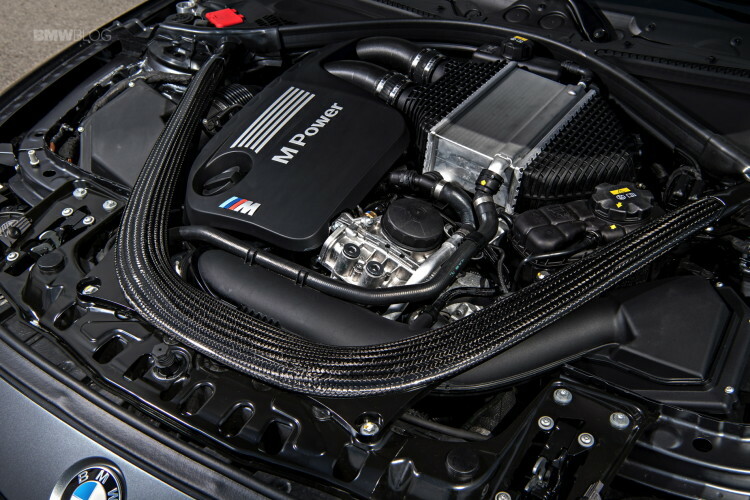 The explanation comes from Franciscus van Meel, the head of BMW M: “water injection improves performance and reduces consumption on combustion engines.” Simple, isn’t it? From the outside one could hardly guess that under the boot floor there is 5 liter water tank which is the key to the whole system. No extra battery, no performance increase by means of a 48 volt system … nothing … just water from which engineers take advantage of the its physical quality to extract energy from the environment as it evaporates. The downside is the increased kilos from such tank and liquid content which means added weight to the vehicle, today’s No. 1 enemy of automotive manufacturers in general (and particularly when we’re dealing with sports cars). The pump supplies water to the injectors at a pressure of approximately 10 bar and the amount of injected water varies depending on load, engine speed and temperature, helping to keep water consumption to a minimum. On hard track driving the water tank has to be topped up every time the GTS is refueled but under normal everyday operating conditions the intervals are much longer, depending on driving style (but even in fast motorway driving, the water tank only needs topping up at every fifth refueling stop). And to prevent system components from icing up in sub-zero temperatures every time the engine is switched off, all the water in the hose system is drained into the tank which in itself is likewise frost proof. As a base engine BMW used the well-known 3-liter inline 6-cylinder twin-turbo which in this application gets some water injected in the mixture in the combustion chamber. If it is true that the general principle of mixing gasoline and water does not sound like something highly recommended, in this case the water evaporates immediately helping to lower the temperature of the engine in some 25 degrees from the inside, allowing it to work more efficiently (less consumption, lower emissions). On the other hand, it reduces the final compression temperature in the combustion chamber, which also reduces the risk of knock, allowing the turbocharged engine to operate with higher boost pressure and earlier spark timing. Compared to the normal M4, the M4 GTS engine delivers a 16% higher output (500 PS rather than 431 PS) at 6250 rpm (vs 5500 rpm on the regular M4). 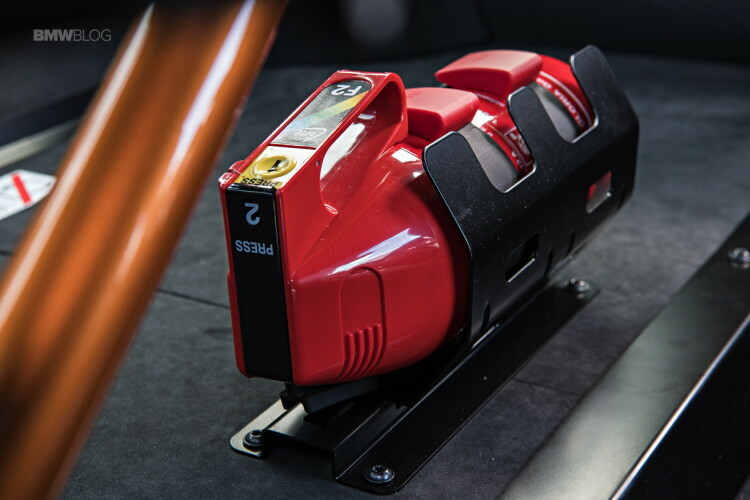 Maximum torque is also 10% higher, peaking at 600 Nm (vs 550 Nm) but available on a narrower engine speed range (4000-5500 rpm whereas the M4 peak torque is fully available under the driver’s left foot between 1850 and 5500 rpm). This boosted by water M4 is catapulted to 100 km/h in just 3.8 seconds (half a second less than the normal M4) and can achieve a top speed of 305 km/h (vs 250 km/h, in both cases electronically restrained). Despite the output upgrade, average consumption equals the one returned by the M4 (8,8 l/100 km). 24 seconds less than the M4, 20 seconds faster than the predecessor M3 GTS, 10 seconds quicker than the Porsche 911 Turbo and a brief 3 seconds off the Lamborghini Aventador LP 700-4 pace. 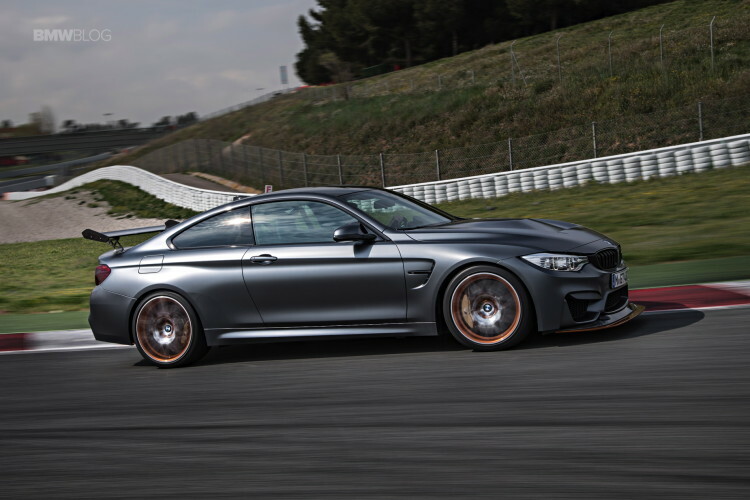 The use of very lightweight materials such as carbon fiber, aluminum, titanium and stiffness reinforcing polymers – alongside some parts with a more basic design, such as door handles or the center console – have been instrumental to allow the M4 GTS to weigh 1510 kg, shedding 62 kg from its normal weight, which means that each pony is not forced to carry a jokey with more than 3 kg on its back. In the moment of truth I hop into the very special M4 GTS at the Montmelo circuit, in Barcelona, where it should be possible to realize if indeed water may serve for much more than quench thirst or extinguish fires. 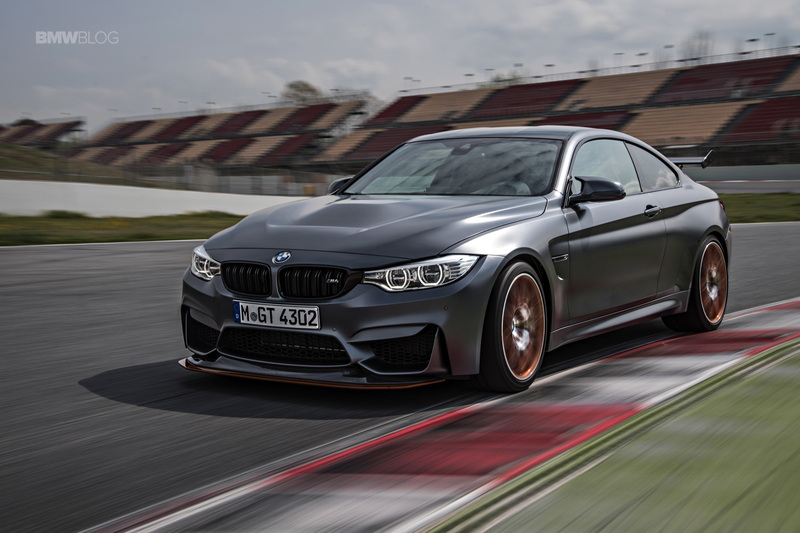 A strong suspicion already raised by the car’s Nurburgring hot lap time of just 7m28s… if the number per se doesn’t ring a bell, let’s put it into context: that is 24 seconds less than the M4, 20 seconds faster than the predecessor M3 GTS, 10 seconds quicker than the Porsche 911 Turbo and a brief 3 seconds off the Lamborghini Aventador LP 700-4 pace. Yes, that good. 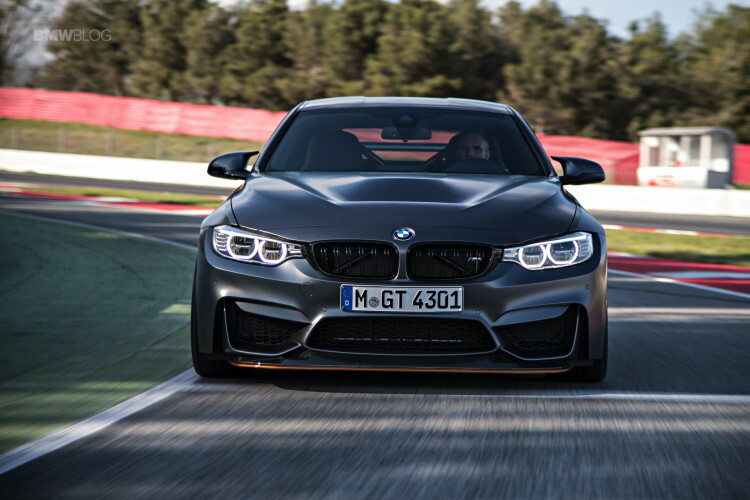 Straight from the first visual contact the M4 GTS prepares you for what lies ahead, starting with the world’s first application of the organic light-emitting diodes (OLED) technology on the rear lights, which produce a more homogeneous illumination effect and have the ability to trigger individual light modules separately. 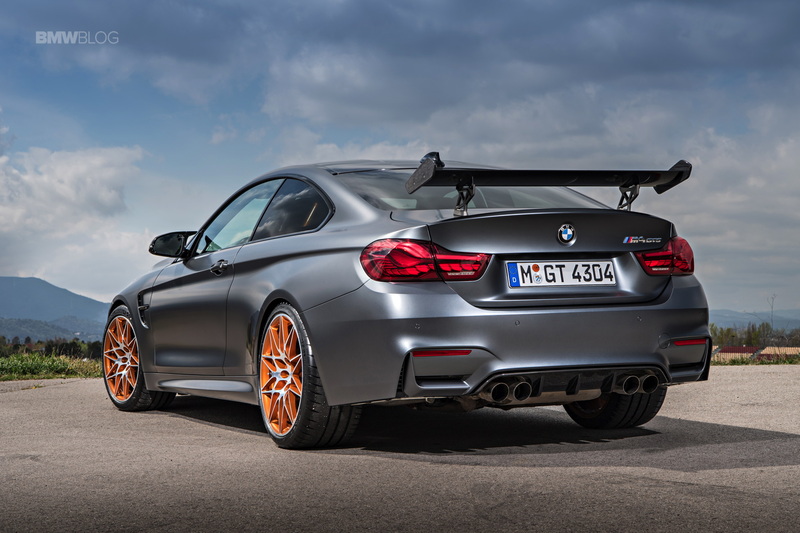 This tail end can be easily distinguished from that of the BMW M4 Coupe by means of the adjustable (in three positions) carbon-fiber rear wing on the boot lid, the exhaust system with its two pairs of titanium tailpipes here with 80 mm diameter and laser-engraved M logo, framed by a structured rear apron. The front view is as eye catching as the rest of the car, namely the front grille with M double bars in black and the powerfully sculpted front apron with its trio of large air intakes, the carbon-fiber-reinforced plastic (CFRP) bonnet painted in body color weighing 25% less than an aluminum equivalent. 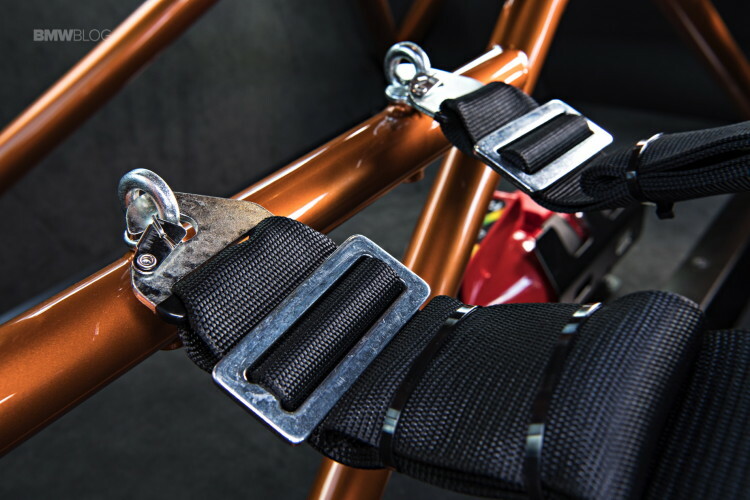 The front end’s weight-minimized splitter is made from lightweight exposed carbon fiber, has a contrasting stripe in bright Acid Orange running along its leading edge and can be set in two positions, for road and track. The car is equipped as standard with high performance M carbon ceramic brakes (made of carbon-fiber-reinforced silicon carbide) which can be visually distinguished by their gold painted six-piston (front) or four-piston (rear) brake calipers with colored M logo. 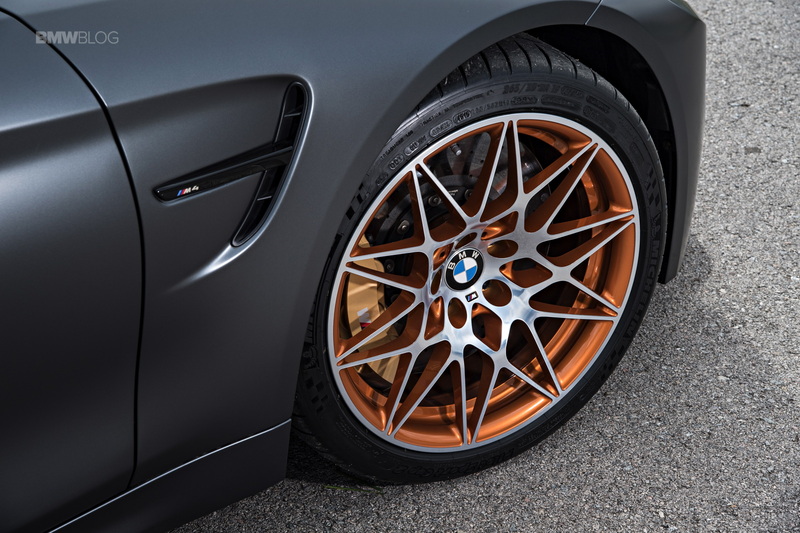 They are surrounded by large, forged M light-alloy wheels (19-inch at the front, 20-inch at the rear), featuring distinctive star-spoke design in Acid Orange and polished surfacing, contribute to give the M4 GTS its ultimate mean look. By your command. When you enter the jet fighter like cabin you immediately sense this is a special M4 as you realize the rear seats are gone but also due to the abundant presence of carbon fiber, aluminum and Alcantara wherever you stare at. The M sports steering wheel, likewise covered in exclusive, anthracite colored Alcantara, pays tribute to motor racing and it seems unwilling to let go of the palm of your hand once it grabs it. And then the carbon-fiber bucket seats (for driver and passenger) use a specific construction to enables a very low-set seat surface and with compelling lateral support but reserving the necessary comfort over long distances. By now it is totally clear it’s going to take a lot of persuading to get me out of this impressive racing machine. Not only am I stuck like a limpet shell in these body molding bucket-seats (featuring six-point harnesses anchored to the behind the seats positioned high strength steel roll bar which are both part of the optional Clubsport Package) but also the engine is on and I am able to fully confirm the prophetic words from the head of the M division: “once you floor the throttle for the first time the titanium sound muffler with leave you with goosebumps“. 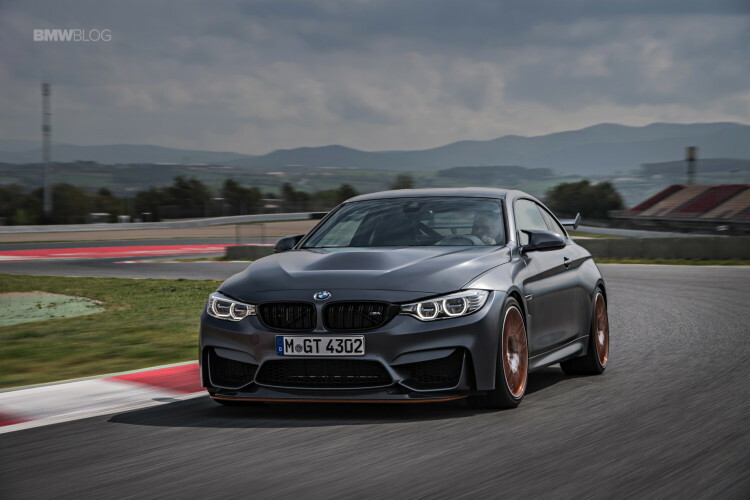 At the end of this heartfelt experience there was really only one serious issue with the M4 GTS: all of the 700 units to be produced have already found an owner. After a first lap to get in friendly terms with the GTS, on the second lap I increase the pace and feel the added commitment from the tires while appreciating the very precise and quick steering action, as the system was adapted to the more ambitious performance envelope (a swivel bearing also allows the use of smaller 9.5 J front wheels – 10,5 J in the rear – and there is no elastic section in the steering column, to create a more direct contact with the driver’s hands. A few more laps down the road and it becomes obvious that the stiffer suspension settings, the new rear differential output shafts (hollow) and the Active M differential (electronically controlled multi-plate limited-slip differential) all conspire to create one of those momentary lapses of reasons when you get to think that only some poor bad career turns prevented you from becoming a racing car legend. From breathtaking acceleration, imperturbable curving skills at unlikely speeds, through to an amalgamation of inextricable ideas which are the leftovers of your reasoning along the 1g plus braking maneuvers at the Montmelo race track, it is difficult to decide what the highlight of the car’s handling is. 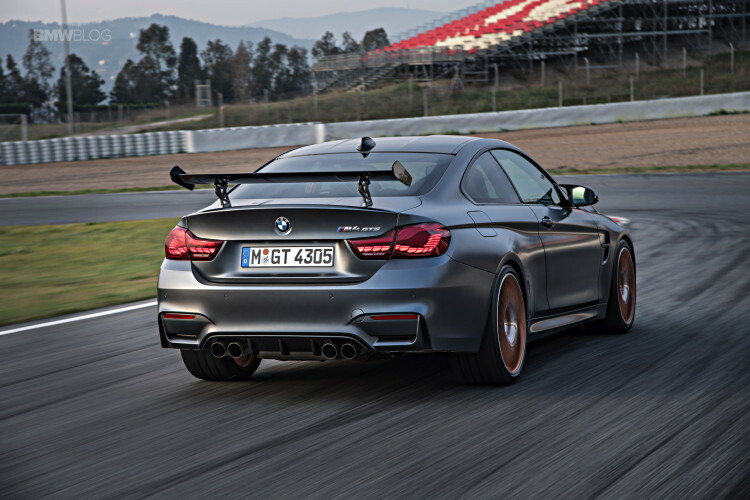 At the end of this heartfelt experience there was really only one serious issue with the M4 GTS: all of the 700 units to be produced have already found an owner, a especially passionate driver who values exclusivity but is very keen on close to the limits sensations behind the wheel. But, of course, an affluent customer for whom entering a rarefied atmosphere of 142 000 euros (twice as much what a “normal” M4 is worth) is nothing but a mere formality. At the end of this heartfelt experience there was really only one serious issue with the 2016 BMW M4 GTS: all of the 700 units to be produced have already found an owner.